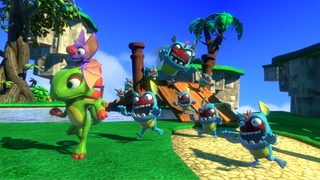 If Rare won’t make a new 3D platformer, the folks at Playtonic Games are happy to. Players seem eager to help out, as Yooka-Laylee has already blown past its original goal of $270,000. Right now, Yooka-Laylee’s sitting at $354,000, but it’s likely to be past that when you read this. Up, up, up...clearly, Yooka-Laylee is going to blow well past its desired number. It won’t be a surprise to see this one settle for one or two million dollars, when it’s all said and done. The characters look a little boring, but maybe they’ll grow on me. I spent way too many hours with the Banjo-Kazooie games as a kid, and I’d certainly invite a chance to revisit that magic.